Not many online casinos manage to bring the quality of their fine desktop versions to a mobile platform, all the while catering for the exact needs of South African gamblers. Thankfully, Casino.com is able to offer all that and more. Not only is Casino.com one of the most reputable online casinos around, licensed and regulated in Gibraltar, operated by ONISAC Ltd and one of the flagship brands of the Mansion Group, but it is also a much sought after mobile casino ZAR. Add to all of that TST Labs certified games and the use of 128-bit SSL data encryption technology and you'll understand the attraction of Casino.com to South African players. As can be expected by an online casino powered by the software provider, Playtech, the games platform at Casino.com is second to none. And now Casino.com also offers games from NetEnt. Alongside popular titles including Starburst and Gonzo's Quest, you’ll also find NetEnt’s hugely successful branded games like Guns N' Roses and Jimi Hendrix. We found the download process fast and smooth, although we could have played the instant version as well if we so desired. Although we naturally migrated to the English version of this platform, we noted that our foreign counterparts have the option of playing in multiple languages including English, Danish, German, Spanish, French, Italian, Portuguese, Russian, Romanian, Swedish and others. All in all, with more than 250 games to choose from, including blackjack, craps, roulette, live dealer games, slots, video poker and jackpot games, there is never a dull moment at Casino.com. If you want to practice games before wagering for real money, Casino.com offers you that opportunity, or you can head straight to real money games to start reaping those rewards. You even get to choose to play in multi-player or private groups for a great range of options. We were impressed with Casino.com's range of bonuses and promotions, beginning with their exciting R4,000 welcome bonus for new players. 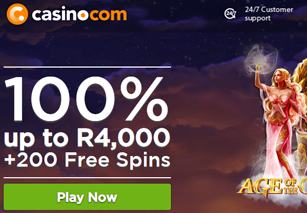 The welcome bonus is a 100% bonus up to R4,000 + 200 Free Spins! The casino offers a 25% reload bonus every Tuesday as well as special monthly promotions that vary regularly. Take advantage of the site's VIP program that offers special benefits to its members such as a personal account manager, exclusive promotions and bonuses, special gifts, VIP only events, higher loyalty point conversion rates and higher deposit limits. If you have any questions when playing at Casino.com , their customer support service is available 24 hours a day, seven days a week to assist you. They can be contacted via multiple convenient methods including email, telephone and instant live chat. There is a toll free telephone number available for South Africa. There is also a FAQ section on the site that provides the answers to general questions.